originals, not copies - hopeandgives Webseite! 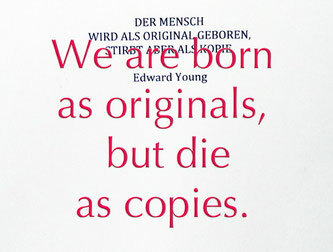 What's to do, if Edward Young is right? Are my ideas copied? My knowledge? My knowhow? My fears? My moments of love? My hopes? Another couple of reasons why we do the project "HOPE & Give". And give a year of our lives for it. The year will pass by. The 730 paintings will be created and given away. But: Nothing of it is copied. It was never done before. A countless swarm of hopes are alive, suddenly. And all hopes are originals. And all who support our crowdfunding are not copying the usual heartbeat of fear. But their individual, authentic triumph of living as THE original. Thank you. And congratulations, dear originals. Superb, what a webpage it is! This webpage presents valuable information to us, keep it up. Pretty great post. I simply stumbled upon your blog and wished to mention that I have truly enjoyed surfing around your blog posts. In any case I will be subscribing in your feed and I am hoping you write again soon! You're so awesome! I don't think I've truly read through anything like this before. So wonderful to discover someone with genuine thoughts on this subject. Seriously.. many thanks for starting this up. This web site is something that's needed on the internet, someone with some originality!